Blair apparently did not want to be on the wrong side of history. ‘Gentlemen: I have, as you are aware, thought a great deal about the relation of this war to Slavery; and you all remember that, several weeks ago, I read to you an Order I had prepared on this subject, which, on account of objections made by some of you, was not issued. Ever since then, my mind has been much occupied with this subject, and I have thought all along that the time for action on it might very probably come. I think the time has come now. I wish it were a better time. I wish that we were in a better condition. The action of the army against the rebels had not been quite what I should have best liked. But they have been driven out of Maryland, and Pennsylvania is no longer in danger of invasion. When the rebel army was at Frederick, I determined, as soon as it should be driven out of Maryland, and Pennsylvania is no longer in danger of invasion. When the rebel army was at Frederick, I determined, as soon as it should be driven out of Maryland, to issue a Proclamation of Emancipation such as I thought most likely to be useful. I said nothing to any one; but I made the promise to myself, and (hesitating a little) – to my Maker. The rebel army is now driven out, and I am going to fulfil that promise. I have got you together to hear what I have written down. I do not wish your advice about the main matter – for that I have determined for myself. This I say without intending any thing but respect for any one of you. But I already know the views of each on this question. They have been heretofore expressed, and I have considered them as thoroughly and carefully as I can. What I have written is that which my reflections have determined me to say. If there is anything in the expressions I use, or in any other minor matter, which anyone of you thinks had best be changed, I shall be glad to receive the suggestions. One other observation I will make. I know very well that many others might, in this matter, as in others, do better than I can; and if I were satisfied that the public confidence was more fully possessed by any one of them than by me, and knew of any Constitutional way in which he could be put in my place, he should have it. I would gladly yield it to him. But though I believe that I have not so much of the confidence of the people as I had some time since, I do not know that, all things considered, any other person has more; and, however this may be, there is no way in which I can have any other man put where I am. I am here. I must do the best I can, and bear the responsibility of taking the course which I feel I ought to take. The subject was the Proclamation for emancipating the slaves after a certain date, in States that shall then be in rebellion. For several weeks the subject has been suspended, but the President says never lost sight of. When it was submitted, and now in taking up the Proclamation, the President stated the question was finally decided, the act and the consequences were his, but that he felt it due to us to make us acquainted with the fact and to invite criticism on the paper which he had prepared. There were, he had found, not unexpectedly, some difference in the Cabinet, but he had, after ascertaining in his own way the views of each and all, individually and collectively, formed his own conclusions and made his own decisions. In the course of the discussion on this paper, which was long, earnest, and on the general principle involved, harmonious, he remarked that he had made a vow, a covenant, that if God gave up the victory in the approaching battle, he would consider it an indication of Divine will, and that it was his duty to move forward in the cause of emancipation. It might be thought strange, he said, that he had in this way submitted the disposal of matters when the way was not clear to his mind what he should do. God had decided this question in favor of the slaves. He was satisfied it was right, was confirmed and strengthened in his action by the vow and the results. His mind was fixed, his decision made, but he wished his paper announcing his course as correct in terms as it could be made without any change in his determination. He read the comment. One or two unimportant amendments suggested by Seward were approved. It was then handed to the Secretary of State to publish to-morrow. After this, [Postmaster General Montgomery] Blair remarked that he considered it proper to say he did not concur in the expediency of the measure at this time, though he approved of the principle, and should therefore wish to file his objections. He stated at some length his views, which [were] substantially that we ought not to put in greater jeopardy the patriotic element in the Border States, that the results of the Proclamation would be to carry over those States en masse to the Secessionists as soon as it was read, and that there was also a class of partisans in the Free States endeavoring to revive old parties, who would have a club put into their hands of which they would avail themselves to beat the Administration. The question of power, authority, in the Government to set free the slaves was not much discussed at this meeting, but had been canvassed by the President in a private conversation with the members individually. Some thought legislation advisable before the step was taken, but Congress was clothed with no authority on this subject, nor is the Executive, except under the war power,-military necessity, martial law, when there can be no legislation. This was the view which I took when the President first presented the subject to Seward and myself last summer as we were returning from the funeral of Stanton’s child,-a ride of two or three miles from beyond Georgetown. Seward was at that time not at all communicative, and, I think, not willing to advise, thought he did not dissent from, the movement. It is momentous both in its immediate and remote resolute, and an exercise of extraordinary power which cannot be justified on mere humanitarian principles, and would never have been attempted but to preserve the national existence. The slaves must be with us or against us in the War. Let us have them. These were my convictions and this the drift of the discussion. There is an impression that Seward has opposed, and is opposed to, the measure. I have not been without that impression myself, chiefly from his hesitation to commit himself, and perhaps because action was suspended on his suggestion. Another New York politician later suggested to painter Carpenter that politician Seward was arranging the picture for history. New York businessman Hiram Barney wrote Gideon Welles a decade later: “The engraving, taken, I think from Carpenter’s painting of the Proclamation of Emancipation, represents Mr. Seward, with pen in hand, as if he had written that paper and had then submitted it to Mr. Lincoln and the cabinet. It is very probable that Mr. Seward chose for himself this attitude in the group, so as to produce the impression that he was the author of that great measure and of the instrument by which it was declared to the world.”13 Other Cabinet members did not appreciate the prominent pictorial position which Seward had appropriated for himself in history. Historian Kenneth M. Stamp wrote: “The fact that Lincoln had decided a month before his reply to Greeley to issue an Emancipation Proclamation did not mean that he was secretly pursuing one policy and publicly another. 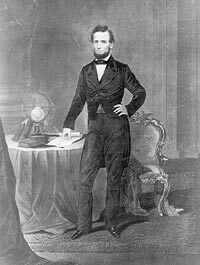 In his Preliminary Proclamation of September 22, 1862, he announced that ‘hereafter, as heretofore,’ the war would be prosecuted to preserve the Union, and that he would continue to press for voluntary, gradual, compensated emancipation and colonization.”18 But that the Lincoln Administration had a new policy direction, few could deny. Allan Nevins, The Statesmanship of the Civil War, p. 130. Allan Nevins, The Statesmanship of the Civil War, p. 130-131. Gideon Welles, Diary of Gideon Welles, Volume I, p. 135 (September 16, 1862). Francis B. Carpenter, Six Months at the White House, p. 22-23. Michael Burlingame and John R. Turner Ettlinger, editor, Inside Lincoln’s White House: The Complete Civil War Diary of John Hay, p. 40 (September 24, 1862). Margaret Leech, Reveille in Washington, p. 289. David H. Donald, editor, Inside Lincoln’s Cabinet: The Civil War Diaries of Salmon P. Chase, p. 149-152. Francis B. Carpenter, Six Months at the White House, p. 88. William Ernest Smith, The Francis Preston Blair Family in Politics, Volume II, p. 186. Gideon Welles, Diary of Gideon Welles, Volume I, p. 142-144 (September 13, 1862). Maunsell B. Field, Personal Recollections: Memories of Many Men and of Some Women, p. 265-266. Francis B. Carpenter, Six Months at the White House, p. 23-24. Burton J. Hendrick, Lincoln’s War Cabinet, p. 364 (Letter from Hiram Barney to Gideon Welles, December 4, 1873). Burton J. Hendrick, Lincoln’s War Cabinet, p. 364 (Letter from Hiram Barney to Gideon Welles, September 27, 1877). Russell F. Weigley, A Great Civil War: A Military and Political History, 1861-1865, p. 176. Donnal V. Smith, Salmon P. Chase and the Election of 1860, Ohio Archaeological and Historical Quarterly, July 1930, p. 555-556. John G. Nicolay and John Hay, Abraham Lincoln: A History, Volume VI, p. 169-170. Gabor S. Boritt, editor, Lincoln the War President, p. 138 (Kenneth M. Stamp, “The United States and National Self-determination”).